Genie9 is a commercial developer of backup, archiving and security software solutions, providing products that combine reliability, flexibility and ease of use for both individuals and organizations. This case study highlights the critical nature of actively managing an affiliate program to drive increased sales via this rapidly growing channel. 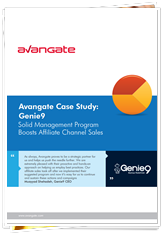 Genie9 leveraged Avangate’s Affiliate System capabilities and promoted their company and products to the Avangate affiliate community, quickly generating positive results directly to the bottom line.